I have die cut this cute white bunny to bring congratulations and a warm welcome to a new baby boy. 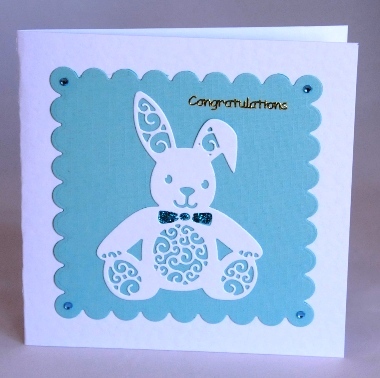 The bunny, with its sparkly blue bow, sits on a square of blue card which I have die cut with a scalloped edge. A blue acrylic gemstone sits in each corner. Congratulations is written in gold lettering at the top of the square and the card is blank inside for you to write your own message of welcome. The design is also available in pink for a girl – please let me know which colour you want at the checkout. If ordering by phone, please reference card #756.